You may know Tim Heidecker as one half of the bizarre comedy duo Tim and Eric. Now, the star of Tim and Eric Awesome Show, Great Job! 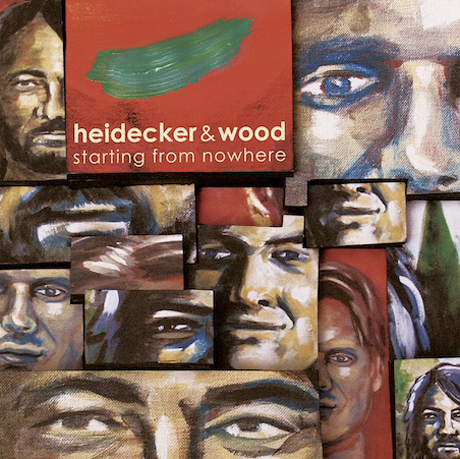 has started a band called Heidecker & Wood, who will release the album Starting from Nowhere on March 15 via Little Record Company. The band also feature Awesome Show composer David Wood. The pair recorded Starting from Nowhere at home over the past two years, later hiring Rilo Kiley's Pierre de Reeder to mix. According to a press release, "Pierre took what began in a bedroom office and a laptop and turned it into something that sounds like it came out of a Sunset Blvd studio." As for what the music sounds like, it reportedly evokes mellow '70s rockers like the Eagles, Billy Joel, Jackson Browne and Steely Dan. There are no songs available online, although this doesn't appear to be a straight-ahead comedy album. It promises to offer a "combination of Heidecker's strange mix of dry humour and sincerity with Wood's spot-on ability to create authentically nostalgic sounding tracks." See the tracklist below. Tim & Eric recently unveiled their hour-long Crimbus Special. See a trailer in the video embedded below. 6. "Life on the Road"
8. "A Song for My Father"
9. "Right to the Minute"
Heidecker & Wood "Wedding Song" / "Christmas Suite"